Tag Archive | "humanitarian food relief"
A new international investing era could be created by a destructive scientific fundamental that is now so powerful it could overwhelm all other factors determining our wealth. This danger has such power that it could destroy most investors and much worse… end civilization as we know it. 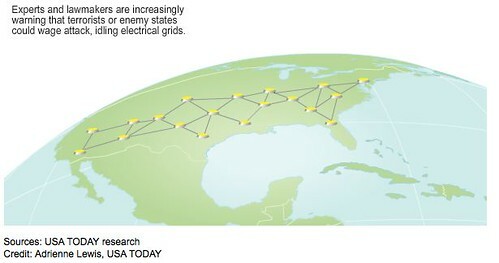 Photo from Wikepedia report on Electromagnetic pulse weapons. The most frightening part is that this force could unleash its destruction on us… now… at any time! I want to share what, why and when this disaster could happen. Then, I want to share how you can be protected rather than ruined. We’ll even see how this, with luck, could be the creator of untold wealth which you, I, and a handful of cautious, insightful investors could share. Before I explain how to safeguard your family from this possible upcoming disaster, let me explain that I first began to understand the magnitude of the risk after reading the New York Times best selling novel “One Second After” written by bestselling author, William R. Forstchen. The story had extra meaning for me because it shows life in a small North Carolina town (similar to where Merri and I live during the summer) after an electro magnetic pulse is detonated by terrorists over the United States. In the story the electrical grid and anything using a computer stopped working due to an Electromagnetic Pulse (EMP) created by just three small nuclear devices, launched from container ships and detonated high above the USA. Without central communication and distribution, mass devastation and chaos ensued immediately. The agony was terrible and life almost unfathomably complicated. What made this fiction meaningful is that the book really documents and details the West’s dangerous reliance on technological systems which are so extensive that no one even recognizes them any more. Adding to the terror of this book is a forward by Newt Gingrich and and afterword by Captain Bil Sanders (USN) one of the foremost experts on EMP. His comment on how an EMP exploded over the US would create the Compton effect and how it would have “devastating consequences on our country” should be examined and understood. It was Captain Sanders’ deep understanding of EMPs that made the warning in this book so powerful. In a moment we’ll share ways to protect against this disaster… that could happen to all of us… suddenly… at any time. First here are three facts that you should know. EMP Fact #1: Many countries, including the US have EMP weapons that have nothing to do with a nuclear bomb and are quite small. They essentially put out a high energy very sharp spike of energy – high frequency and very short wavelength, short duration pulse. However it is the nuclear EMP device that creates the greatest risk. These are nuclear bombs that DO NOT CREATE DAMAGE FROM THEIR BLAST, HEAT OR NUCLEAR FALLOUT. Instead the weapons create an electrical wave that fries just about anything with a computer. A survey of open sources over the past decade finds that knowledge about EMP and EMP attack is evidenced in at least Britain, France, Germany, Israel, Egypt, Taiwan, Sweden, Cuba, India, Pakistan, Iraq under Saddam Hussein, Iran, North Korea, China and Russia. Russian and Chinese military scientists in open source writings have shown how to design nuclear weapons that generate an extra powerful EMP effect called Super-EMP that can destroy even the best protected military and civilian electronic facilities. This is explained in a recent USA Today article entitled “Electrical grid vulnerable to terrorist attack” by Thomas Frank. 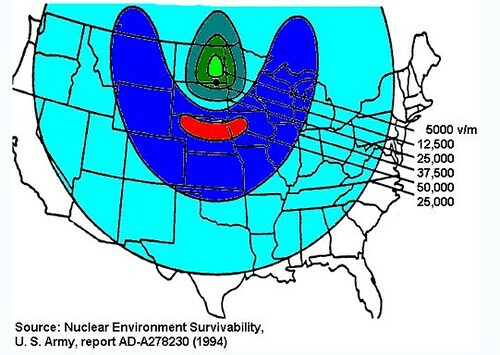 Here are excerpts from that article: It sounds like a science-fiction disaster: A nuclear weapon is detonated miles above the Earth’s atmosphere and knocks out power from New York City to Chicago for weeks, maybe months. This graphic is from the USA Today article linked below. Experts and lawmakers are increasingly warning that terrorists or enemy states could wage that exact type of attack, idling electricity grids and disrupting everything from communications networks to military defenses. “The consequences would be catastrophic,” said Joseph McClelland, director of the energy commission’s Office of Electric Reliability. Full recovery could take up to 10 years, he said. The scenario involves a phenomenon called an “electromagnetic pulse,” or EMP, which is essentially a huge energy wave strong enough to knock out systems that control electricity flow across the country. The immediate effect would resemble a blackout. Although blackouts can be restored quickly, an EMP could damage or destroy power systems, leaving them inoperable for months or longer. House Homeland Security Committee Chairman Bennie Thompson, D-Miss., is pushing a bill to give the energy commission broad authority. The commission studying the threat says the U.S. is ill-prepared to prevent or recover from an EMP, a vulnerability could invite an attack. “We are not well-protected at all,” said Michael Frankel, who was executive director of the commission. EMP Fact #3: If an EMP event takes place, the Western World could quickly run out of food. Here is an excerpt of a transcript of a speech given by Professor Sir John Beddington, chief scientific adviser to the British government, at the GovNet SDUK09 event. This has become know as “The Perfect Storm” speech. I spoke here last year at about the same time about the issue of the food crisis and the burgeoning increases in food prices that were being driven by population growth, use of biofuels and so on. The first problem here is that we really have a major issue. This graph takes a little bit of explanation; it is the ratio of our reserves to our consumption. 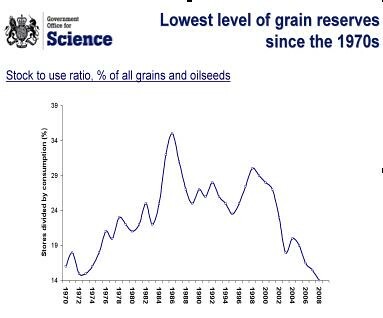 What it is showing is that last year is the lowest level of reserves that we have had as a proportion of our consumption in years, since 1970 and actually since records were taken of this sort. That means that we’ve got somewhere like reserves of around 14% of our consumption, that implies, give or take, 38 or 39 days of food reserves if we don’t grow any more. As you can see, it’s the lowest level that we’ve actually had. Is that a problem? Well the answer is yes it is going to be a problem. We saw the food spike last year; prices going up by something in the order of 300%, rice went up by 400%, we saw food riots, we saw major issues for the poorest in the world, in the sense that the organisations like the World Food Programme did not have sufficient money to buy food on the open market and actually use it to feed the poorest of the poor. But this is England, not North America. Right? America’s food reserves are even worse as explained in this excerpt from last year’s article “The US has no grain reserves” published in the Tri State Observer, Milford, PA. The excerpt says: Larry Matlack, President of the American Agriculture Movement (AAM), has raised concerns over the issue of U.S. grain reserves after it was announced that the sale of 18.37 million bushels of wheat from USDA’s Commodity Credit Corporation (CCC) Bill Emerson Humanitarian Trust. “According to the May 1, 2008 CCC inventory report there are only 24.1 million bushels of wheat in inventory, so after this sale there will be only 2.7 million bushels of wheat left the entire CCC inventory,” warned Matlack. “Our concern is not that we are using the remainder of our strategic grain reserves for humanitarian relief. AAM fully supports the action and all humanitarian food relief. The CCC is a federal government-owned and operated entity that was created to stabilize, support, and protect farm income and prices. CCC is also supposed to maintain balanced and adequate supplies of agricultural commodities and aids in their orderly distribution. “This lack of emergency preparedness is the fault of the 1996 farm bill which eliminated the government’s grain reserves as well as the Farmer Owned Reserve (FOR),” explained Matlack. In 1996, the Federal Agriculture Improvement and Reform Act of 1996 (“Freedom to Farm Act”) called for elimination of government stockpiles of grain. I’m sure someone thought it made sense, at the time. The book, “One Second After”, clearly and very dramatically (but I am not sure how accurately) drives home the point that unless a person takes a unique financial stance that his finances, and maybe even his or her life, could be wiped out. Many military and scientific studies support this monumental economic, social and life threatening risk. Yet you do not have to ruined by EMP. You may even find that this potential weapon will create extra ordinary wealth that a few investors will share. Here is how and why. 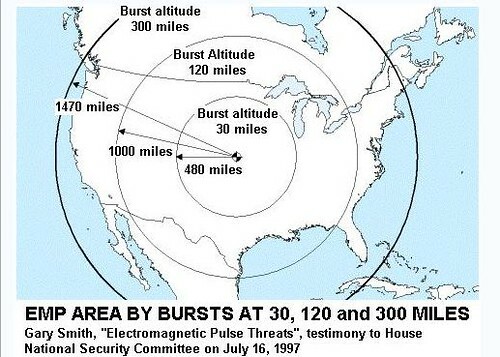 First, there is no proof that an EMP event as described above would create quite the havoc mentioned above. Here is how one scientist whom I have known for years and trust completely, explains this. “I’m not sure how large an effect the nuclear device would have above the atmosphere — the pulse might dissipate somewhat along the earth’s electromagnetic field. It would probably take out a lot of communications and military satellites. EMPs could be the driving force for the next investing era. Just like the nuclear threat in the Cold War… an EMP attack may never happen. Yet because it could… the perception of risk… has created a huge rush by many governments to develop new weapons and forms of protection… just as during the Cold War. This site and our multi currency site have repeated many times how stock market bulls and bears are based on cycles of human interaction, war, technology and productivity. These cycles are intricately connected with the new waves of productivity that grow from the great human platform of combat. The cycle goes like this. An economic downturn enhances a war or threat of war. Struggles for survival in the war (like the Civil War, WWI, WWII and the Cold War (WWIII), super charge inventiveness that creates new forms of productivity…the steam engine, the internal combustion engine, production line processes, jet engines, TV, farming techniques, plastics, telephone, computer and lastly during the Cold War, the internet. Each new invention helped win a war. Shifting the technology to domestic use… after the war… created a boom. Each boom leads to excess. Each excess led to a correction. The correction creates an economic downturn. The economic downturn enhances a war or threat of war. Here we are… in the correction again… at the correct time when we should expect that another war (or threat of war such as the Cold War) should begin to build! This latest downturn started almost exactly (1998), 16 years after the last boom began (1982)…which began after the last great human struggle called the Cold War. If the cycle repeats, the struggle should build now due to the poor economy. The key for spotting the greatest investment opportunities is to spot the next big invention… the technology that will spin out of WWIV. The key is that a problem must have such severe consequences (such as losing the war and being destroyed) that all stops… all logics of return on investment are ignored. Technology and research are pushed full steam ahead regardless of cost. The threat must be real and serious… like EMP. There are seven steps you can take to assure that you are not destroyed by an EMP. #1: Move well away from the USA…. to an agriculturally based country. This is one reason Merri and I have been active in Ecuador for nearly 15 years. #2: Move to Small Town USA. Our sites have been looking at the benefits of this for years and why we live on agricultural property. #3: Create your own source of food. #4: Create a local source of hardened energy and communications. This is one reason our newest real estate purchase is also agricultural property and already has a HAM radio tower installed. #5: Keep some gold and or silver on hand. #6: Know how to take care of your own health. #7: Hold some assets outside of North America. Merri and I have already taken six of these seven steps… and are well on our way to completing the seventh step. From this we learned one really important point. You should not suffer in the process of gaining this protection either. Merri and I did not move to the country… buy our Blue Ridge farm… set up our own food supply… start our garden… buy agricultural land in Florida… get a ham radio tower… buy gold and silver… organize assets out of the US and become involved in taking care of our own health naturally because we were worried about EMPs. We did so because we wanted to. Chances are that an EMP attack will NOT take place. During the Cold War nuclear bomb shelters were not required! Yet can we take a chance? Ignoring this risk and with no action is not the answer either. Instead let’s share ways and lifestyle alterations that protect as they provide joy, satisfaction, better health and enhanced wealth. You may not be able to (or want) to move your home abroad or to a rural area. Yet gardening, even in urban areas, can be healthy and fun. Holding some precious metals is probably a good investment anyway. We should be taking care of our health even when their is no threat of war. When it comes to holding assets abroad… our multi currency course can help. Since mankind began, every generation has endured some great threat or risk. Yet here we are… still growing! Only time will tell whether EMP will create havoc or the greatest new wave of wealth we have seen. Whichever, Merri and I will be here to share the experience with you. The greatest asset of all is the ability to earn wherever you live, which brings everlasting wealth. This is why I am giving everyone who enrolls in our North Carolina or Ecuador International Business & Investing seminar in October or November our “Tangled Web… How to Have an Internet Business Course” (offered at $299) free. Here are comments from a reader about the way we help: Thank you for your inspiration and information outlining foreign banking and retirement. Your comments and suggestions are welcome for planning the steps to evaluate the early stages of living abroad. The US has no grain reserves” published in the Tri State Observer, Milford, PA.